Mish's Global Economic Trend Analysis: Cross-Border Deflation: US Export Prices Collapse Most Since July 2009; How Damaging is Price Deflation? Cross-Border Deflation: US Export Prices Collapse Most Since July 2009; How Damaging is Price Deflation? Today's Import/Export report will have alarm bells ringing in the heads of various Fed members. 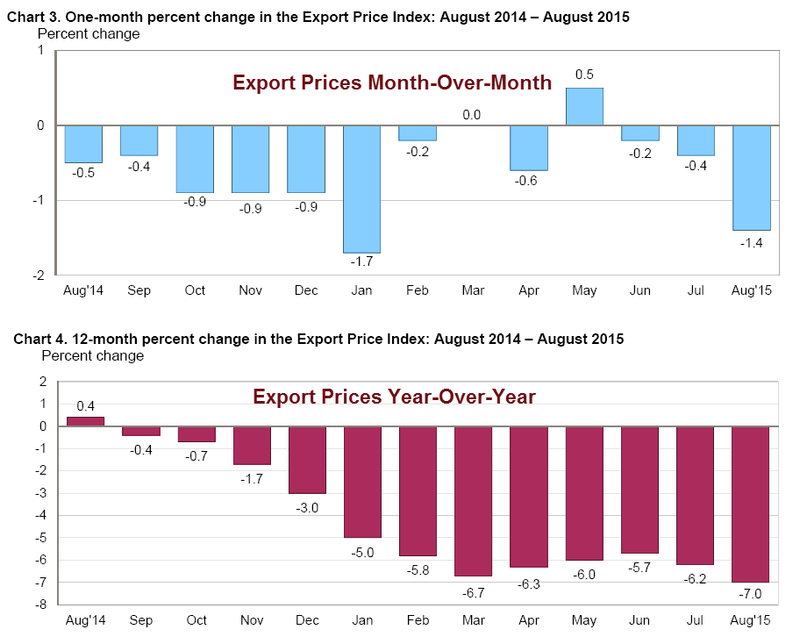 Month over month, export prices fell 1.4% with the Bloomberg Consensus opinion at -0.4%. The decline was outside the range of any estimate. Economists' estimates ranged from -1% to +0.1%. Significant declines sweep nearly all categories of the import & export price report pointing squarely to a deepening of cross-border deflationary pressures. Import prices fell 1.8 percent in August, slightly more than expected, while export prices fell 1.4 percent which is substantially more than expected. The monthly drops for both are the steepest since the oil-price rout of January. Petroleum pulled down the import side but even when excluding petroleum, prices fell 0.4 percent. 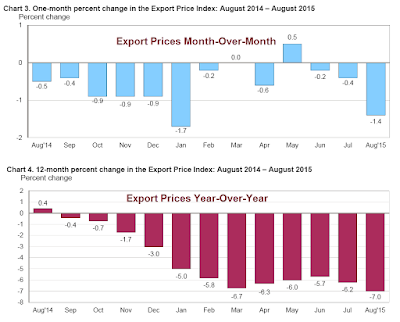 Export prices were hit by lower prices for industrial supplies, foods-feeds-beverages, and also agricultural products. And finished goods, whether on the import or export side, show a run of minus signs for both the monthly readings and the year-on-year readings. Year-on-year rates are severe, at minus 11.4 percent for total imports, which is the lowest since September 2009, and minus 7.0 percent for exports which is the lowest since July 2009. Let's dive into the BLS report on U.S. 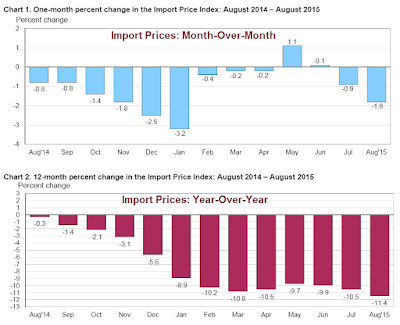 Import and Export Prices for more details and charts. In case you missed it, please see China PPI Declines 42nd Consecutive Month; Banks Struggle to Contain Devaluation Fallout; More Capital Controls. How Damaging is Price Deflation? The Fed focus on prices is ridiculous as noted on numerous occasions. For discussion of the nonsensical perils of CPI deflation, please see Historical Perspective on CPI Deflations: How Damaging are They? The Fed's very attempt at producing "price stability" does exactly the opposite over the long haul. It is only over the short haul in which Fed policy actually "appears" to work. Middle-class damaging boom bust cycles of ever-increasing amplitude over time are proof enough. I would love to debate Bernanke, Yellen, or Krugman on this any time, any place. Price stability is defined by the Fed as 2% CPI inflation annualized, perpetually. That's an exponential function. For further rebuttal and charts of the Fed's nonsensical definition of "stability", please see my posted email from Steve Keen regarding the Exponential Credit Petri Dish.